Here’s some really exciting news – Jermaine Rogers is releasing a second colorway of his new Animal Resin Figure exclusively at Designer Con! 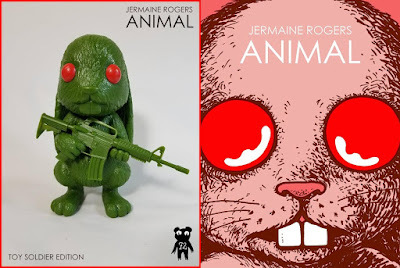 Along with the previously announced Shadow Edition Animal comes the all green Toy Soldier Edition Animal. “So many little animals want to play pretend...” Sculpted by Bigshot Toyworks and painstaking produced at MANA Studios, the new Designer Con 2018 Exclusive Toy Soldier Edition Animal resin art figure stands 8” tall, features striking red eyes and comes holding a matching army green machine gun. Limited to just 50 pieces, this exclusive can be purchased this weekend at Rogers’ DCon booth #1713.